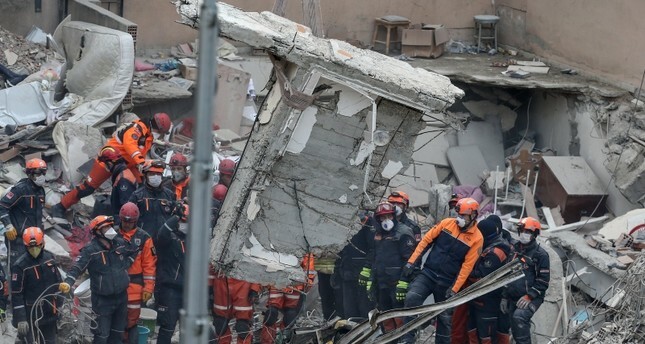 Search and rescue teams pulled all 35 people trapped under the rubble on Sunday, after an eight-story building collapsed in Istanbul's Kartal district last Wednesday. Twenty-one people lost their lives, while 14 others were rescued in the tragic incident. Scores of Disaster and Emergency Management Presidency (AFAD) personnel, fire crews, police and emergency medical teams were on the scene in Kartal's Cevizli neighborhood and worked day and night to reach those under the debris. The eight-story building was originally built as a five-story building in 1992 and the top three floors were illegally added in later years. There was also a textile workshop on the ground floor of the building that was operating without a license. Reports noted that some of the load-bearing columns at the bottom of the building had been removed, which is believed to be one of the reasons for its collapse. Another building next to the collapsed one, which was evacuated shortly after the incident will be demolished as an investigation revealed it may also collapse, reports said. A total of seven risky buildings have been evacuated after the incident. Istanbul prosecutors have launched an investigation into the incident. Interior Minister Süleyman Soylu said that search and rescue efforts will continue.